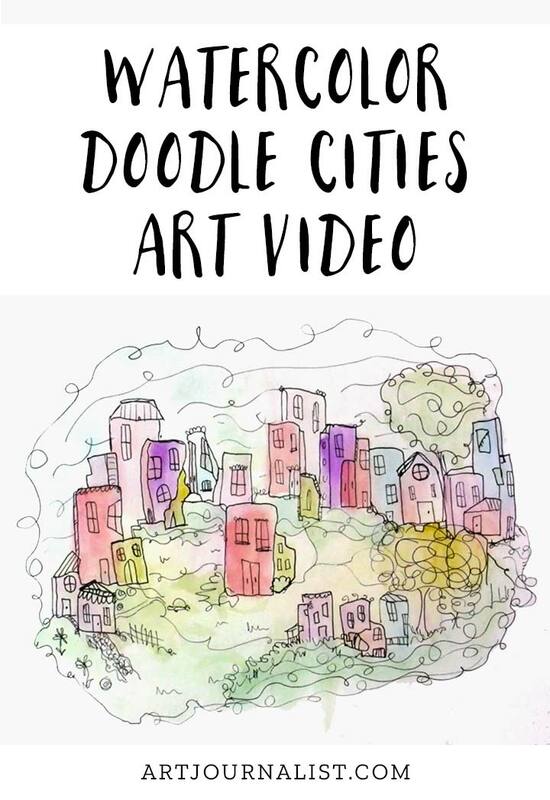 Lately I am having lots of fun creating these watercolor doodle cities and I am so happy the stars aligned so I could have a chance to make this video sharing the process I use in making them! I am on this huge watercolor kick right now, especially because they are super portable and don’t create a gigantic mess. I used to struggle with really making them work for me, and it definitely gets to be a LOT easier and a LOT more fun once you learn the basics for how to watercolor. I also love that you don’t need a lot of supplies when you are working with watercolors. You basically just need some sturdy watercolor paper, water, and paint. Once the paint is dry, I simply doodle over it with a Micron pen. How simple is that? Another reason I love this paint-and-doodle method is because you can paint lots and lots of backgrounds all at once. Then, at any point later you can always pick one up when dry and start doodling away! Actually, before I made this cityscape you see in the video, I’ve made quite a few others! This one shown above uses a similar color palette used in the video. In this one, I used mostly blues, greens and purples – it gives it a whole different kind of vibe! Both of these paintings started out using the same process I use in the video. 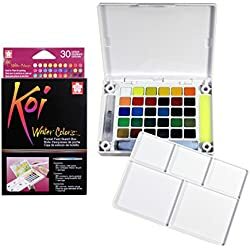 Sakura Koi Watercolor Field Set: I love this set of ultra-portable watercolors – they are always with me when we travel! My set is well loved! 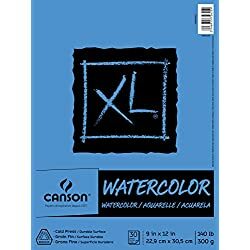 Canson 140lb Cold Pressed Watercolor Paper: I love this paper – it really holds up well and is a great affordable option. 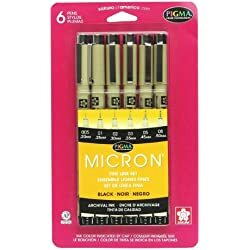 Micron Pens: There’s something magical about Micron Pens, which is no doubt why they are a staple for everyone who loves Zentangle and doodling. Any sort of permanent ink pen would work fine though. 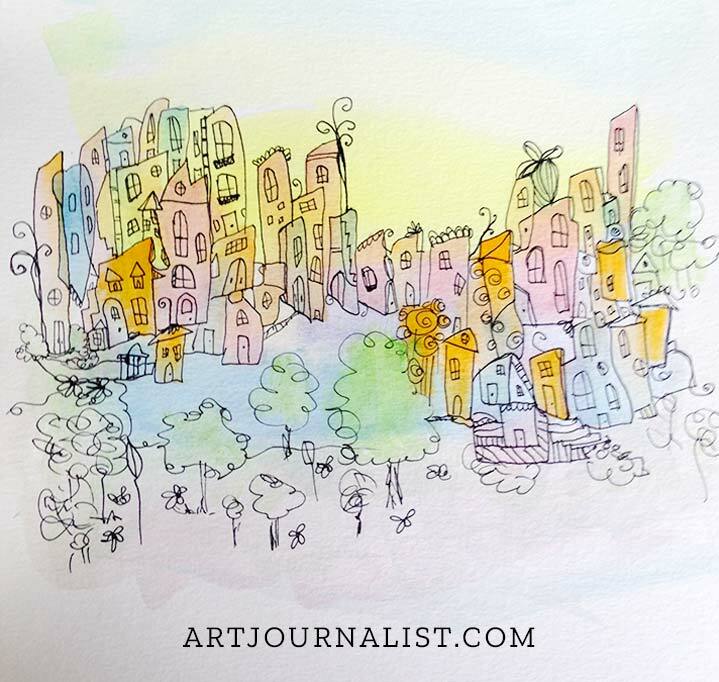 The process for making these watercolor doodle cityscapes is super simple. In fact, once you start making art like this, you might not stop! I first start just by putting some water on the paper and using the lightest colors first do a basic swirly type of wash. The next step is to paint in the building shapes. This is usually just basic straight line strokes with a flat brush. Later, I come in and add more fill and layers with a smaller round brush. I also add a little bit more detail, like subtle shadows and lines. I will admit, I do have a tendency to overwork watercolors. If you can do the “less is more” approach you likely will get better results! There’s really no wrong way to doodle. I basically just outline wherever the paint might lead me and then add in curvy lines, straight lines, and swirls. Sometimes I doodle little flowers and trees, too. I like to first start with a thicker Micron 05 pen for the basic lines and shapes – then later I switch to a Micron 01 pen for the finer detail work. 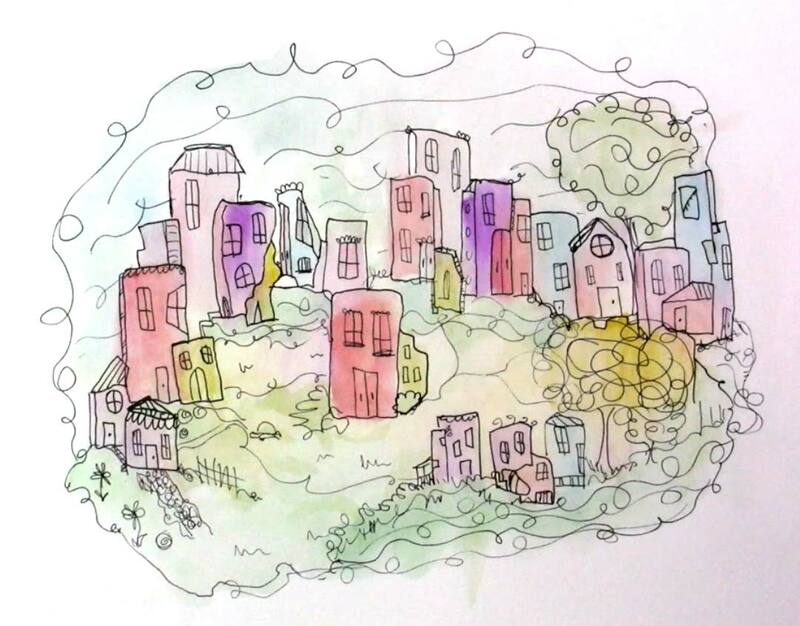 Here’s Our Finished Watercolor Cityscape! If you want to watch the video in full-screen mode, it’s available on our Artjournalist Art Videos YouTube Channel. And yes, Please Subscribe! Want to Try This Technique? I’d Love to See What You Create! This technique is great because you really can make almost anything with it – you don’t necessarily even need to paint cityscapes. You could do landscapes, animals, objects, or even just abstract designs and patterns – the sky really is the limit! You could combine this with all sorts of other watercolor techniques! 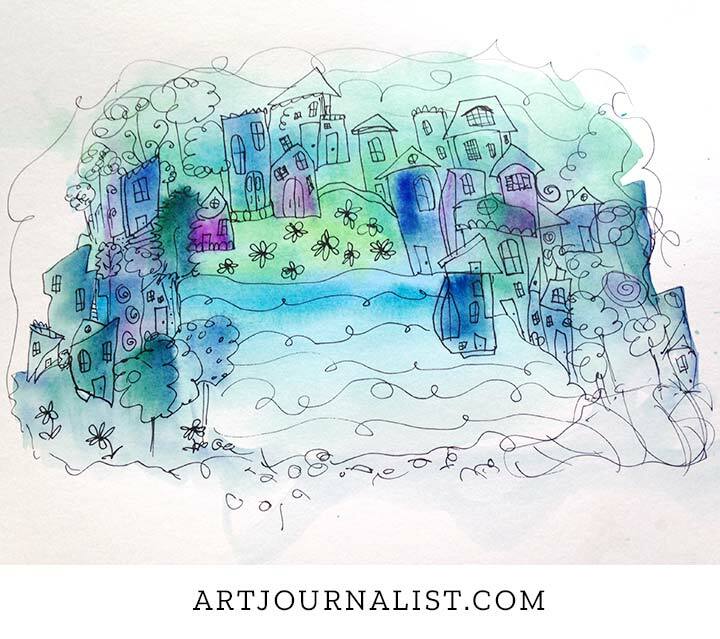 It’s super simple AND super fun – so I hope this might inspire you to try making something with watercolors and doodling over it with ink. And if you do make something, you know I would love to see it! 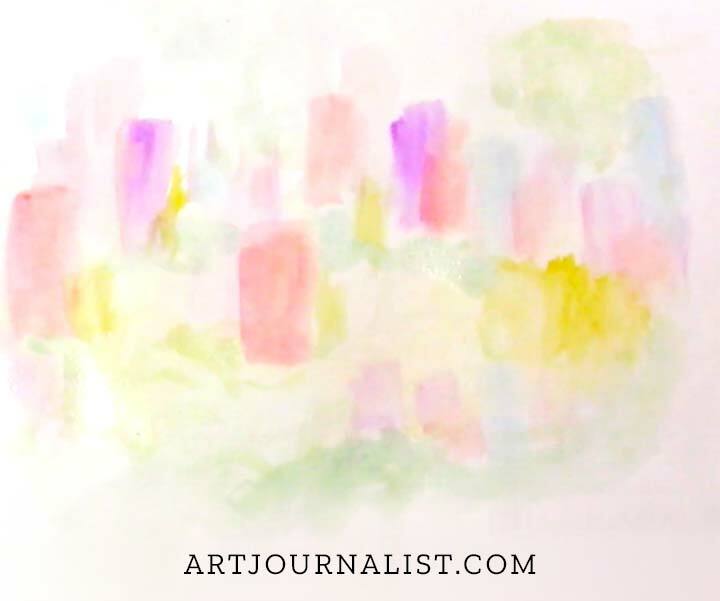 You can share your art & ask questions anytime in our online Facebook group. And of course, I’m always happy to hear your thoughts or ideas and answer any questions you might have in the comments section below!